Attending a live event can be a big investment of time and money when you are running a business. Time away from clients, time away from your to-do list, but equally (and more positively!) it can give you time away to reflect, to brainstorm new ideas and to connect with new people. To work on your business, rather than in it! It can, however, be all too easy to slip back into the ‘day job’ as soon as you are back at your desk. 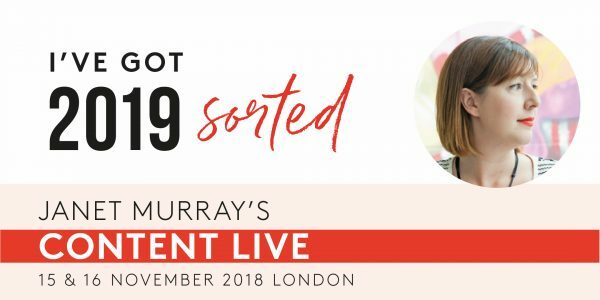 After attending Janet Murray’s Your Year in PR event last year, I decided to return for the newly branded Content Live. It has a brand new look, an amazing new speaker line up and new people to meet from the Love Marketing Membership. 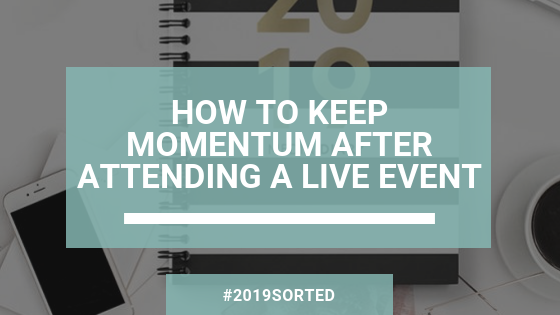 Here are a few thoughts on how I intend to keep up the momentum after I’ve attended the event and equally make the most of everything I learn and all the ideas that are generated once I’m back at my desk. Last year I only attended day one of Your Year in PR and I had serious FOMO. So this year I decided to invest and attend both days of the event. Not least because there are equally amazing speakers lined up for both days! I’m also looking forward to spending day two fleshing out my content plan for 2019. I only really managed to make a start on my 2018 plan at the event last year, as the day went so quickly (in a good way)! A one-day event can go by in a bit of a blur and in a room of 70+ people I may not have not have had the chance to speak to even half of the room. I’m looking forward to reading the event workbook, with profiles on all the attendees, and I’ve already made a mental note of people I’d like to speak to. Attending both days should lead to some really good quality conversations without feeling the need to rush. I have found that it is best to strike while the iron is hot after getting lots of ideas from events like this. It is easy to falter when it comes to implementation if you don’t tackle some quick wins or decide to firm up any actions. So I have some time booked in with my Digital Mums trainee Kat and my content writer Sophie within a week of the event to help download some ideas and to come up with a plan of action for us all. In all honesty, I’ll also need to sit in a dark room for a while or head out for some fresh air to absorb everything as events can be draining, even a little overwhelming. After a couple of days networking and planning, I’m sure that my brain will need some downtime after all the excitement! Janet’s events are well known for their amazing workbooks (and goody bags! ), which I’m sure I’ll be making lots of notes in. However, I’ve also created a very simple one-pager to help crystallise the key actions I want to take from the event. I aim to commit to just one or two key actions per speaker. If I can distil everything I learn into the key actions that have the potential to make the biggest impact in my own business, hopefully, I can keep any overwhelm at bay. You can download a copy of the template I’ll be using here if you’d like. Which leads nicely to my next point. Every single session over the next two days will be full of great advice on how to plan & create great content, and how to stand out online through our branding and marketing. The temptation could be to try and do everything suggested, simply because that’s what we are told we ‘should’ do if we want to be successful! However, I will also be having a stern word with myself that I can’t do everything! I’ll take some time to reflect on my journey home each day before I decide on the right thing to focus on in my business. As Andrew & Pete often say, it is far better to nail one social media channel for example, rather than trying and failing to be everywhere and do everything. I can always park other ideas for next year or simply decide that they aren’t for me. And that’s OK. Finally, I think it is really important to share what you learn with others. So I’m looking forward to pulling together some insights from Content Live that will benefit my clients. I hope to share some of those insights here too on the blog. I’m also looking forward to sharing what I learn with my peers and team members. That way, we all win!